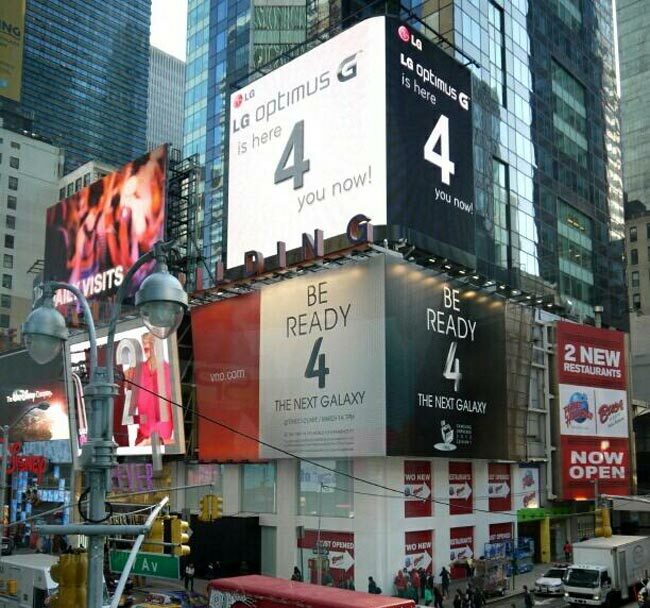 Samsung will unveil the Samsung Galaxy S4 at a Samsung Unpacked event in New York later today, the event will be live streamed in Times Square and Samsung has had billboards advertising the S4 event in Times Square for the last few days. LG has decided that it would be a good idea to post a larger advert above Samsung’s advert in Times Square, which you can see in the photo below, and you can see that LG’s Optimus G advert is clearly aimed at upstaging Samsung’s Galaxy S4 launch. We suspect Samsung may end up selling just a few more handsets than LG with their new Samsung Galaxy S4, we will have more details on the Galaxy S4 later today.